been repaired and he was on his way again from Pensacola to his destination in Miami with all tires in good order. 24/7 monitoring by TireVigil Cloud looked out for Dan while he was dealing with all the complications of travelling in Florida in the wake of hurricane Irma by tracking the tire problem when it first developed beginning on Saturday evening until it became a potentially catastrophic condition by early Sunday morning due to nails that he unknowingly had driven over. After his tire was repaired by a local tire dealer in Pensacola Dan Bitton had confidence that he could drive safely to his destination in Miami due to the visibility TireVigil Cloud provides. For fleets that need to get important goods to their destinations, on-time and without incident, whether traveling into disaster areas or just ensuring that customers’ goods are delivered with confidence in normal weather conditions, TireVigil Cloud is what they depend on. Rochester Hills, MI (September 14, 2017) – TireStamp reported that its TireVigil Cloud, a truck tire monitoring system, enabled 5366 Logistics fleet owner, Dan Bitton, to successfully deliver medical supplies to Florida hospitals in the wake of Hurricane Irma. 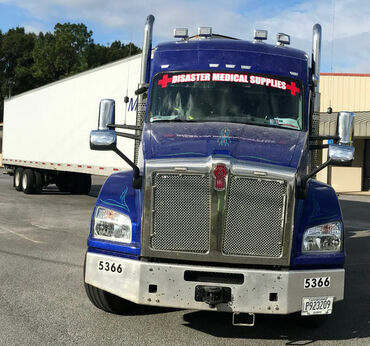 On Friday night, September 8th, Dan received a request from a Chicago headquartered international medical supply corporation to assist in the delivery of medical supplies to Florida to resupply hospitals as Hurricane Irma blew through the state. He picked up a trailer loaded with medical supplies and headed from his Chicago area base of operations to Florida. TireStamp is the leading developer of innovative Tire Pressure Monitoring Systems (TPMS) for trucks that meet the TPMS 2.0 standard for commercial, construction, industrial and passenger fleet operators. TireVigil Cloud is available directly to fleet carriers, leading tire dealers and comme‍‍‍rcial tire OEMs. As an asset intelligence company utilizing a Software-as-a-Service (SaaS) business model, TireStamp provides expertise on tires and their effects on fleets' operating costs, tire program management, asset management and other critical performance data that enable fleet users to reduce tire and fuel costs in addition to improving productivity and safety.